AMD's dual-socket Quad FX platform is official. Code named the 4x4 platform, its AMD's answer to Intel's Quad Core chips. 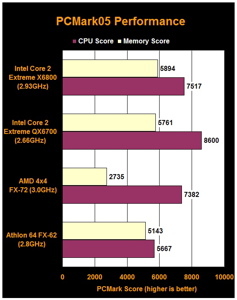 The platform is powered by two dual-core Athlon 64 FX-70 series processors. Its based around Nvidia's nForce 680a chipset and as we've already seen from Asus' initial 4x4 mobo, can support up to 12 SATA ports and four PCI-Express cards. 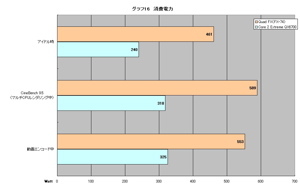 The folks at PC Watch and ExtremeTech have done some early benchmarking on the chips comparing them to Intel's Quad Core CPUs and found this out. AMD's QuadFX power consumption is far higher than Intel's Quad Core. In fact, it uses almost double the amount of watts (589 vs 318). The irony is that in the past the tables were usually the other way around. Performance-wise, ExtremeTech found out in multiple tests that Intel's solution usually came out ahead of AMD's Quad FX platform. Again, this doesn't look good for AMD, who's not only late to the party, but is now taking a beating from the competition. However, compared to Intel's $999 Core 2 Extreme QX6700, AMD's chips (the FX-74, FX-72, and FX-70) will be sold in pairs for $999, $799, and $599 respectively. And when AMD's quad-core CPUs are unleashed next year, you'll be able to pop them into the Quad FX platform and build yourself an eight-core Quad FX system (and take over the world).